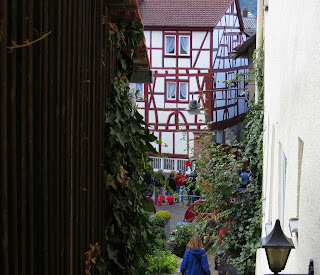 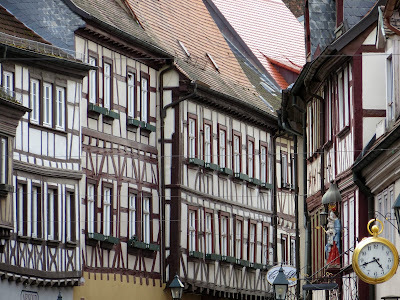 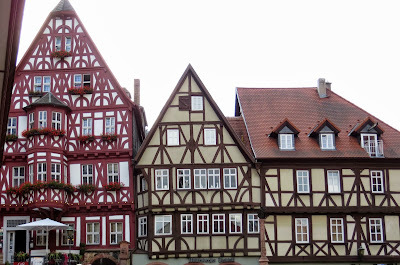 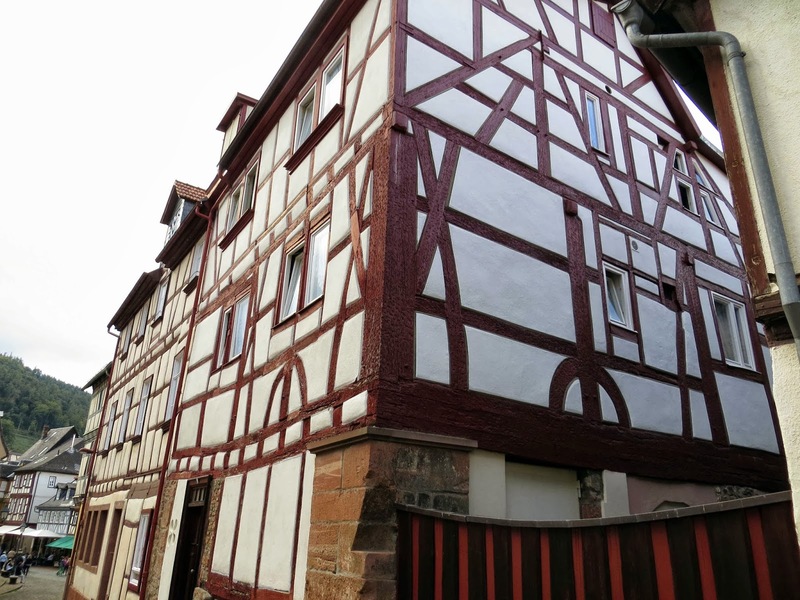 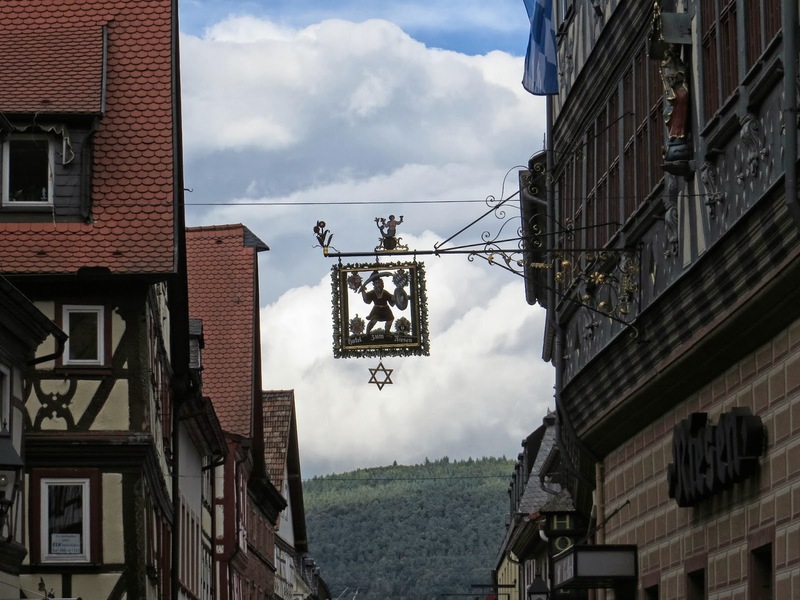 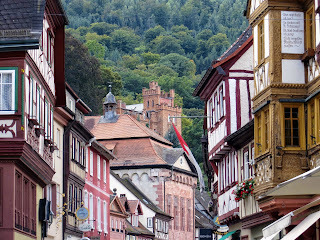 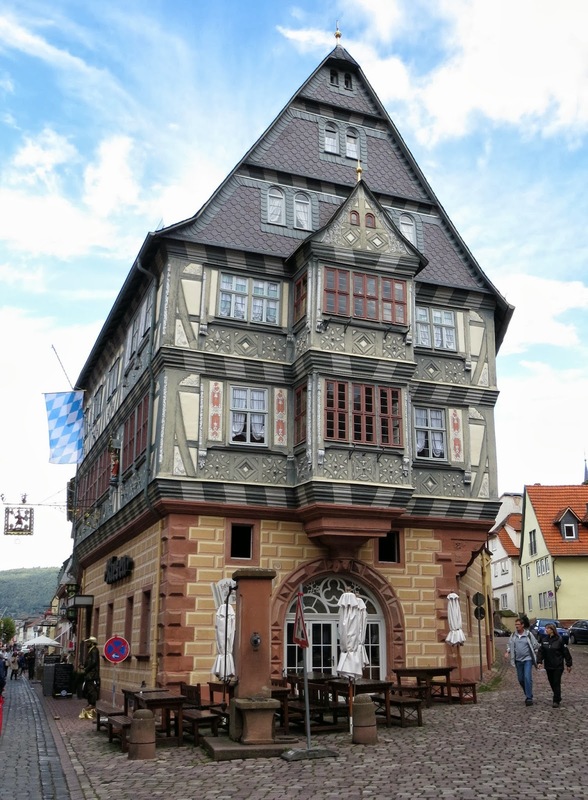 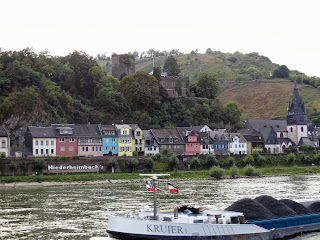 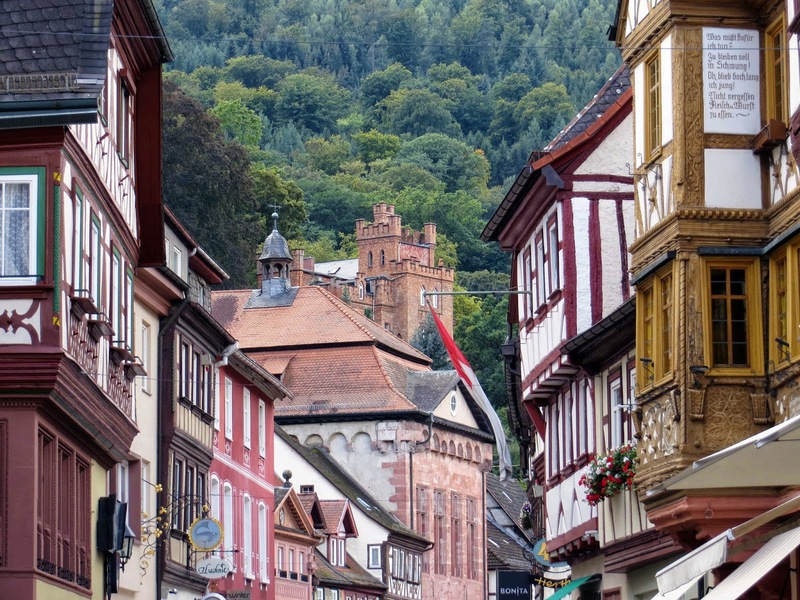 The ship departed for Miltenberg during lunch, arriving late in the afternoon for a brief walking tour along crooked cobblestone streets lined with steeply gabled, half-timbered houses. 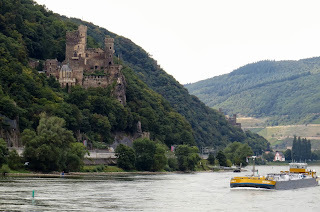 Later, the ship left Bavaria and the Main River behind. 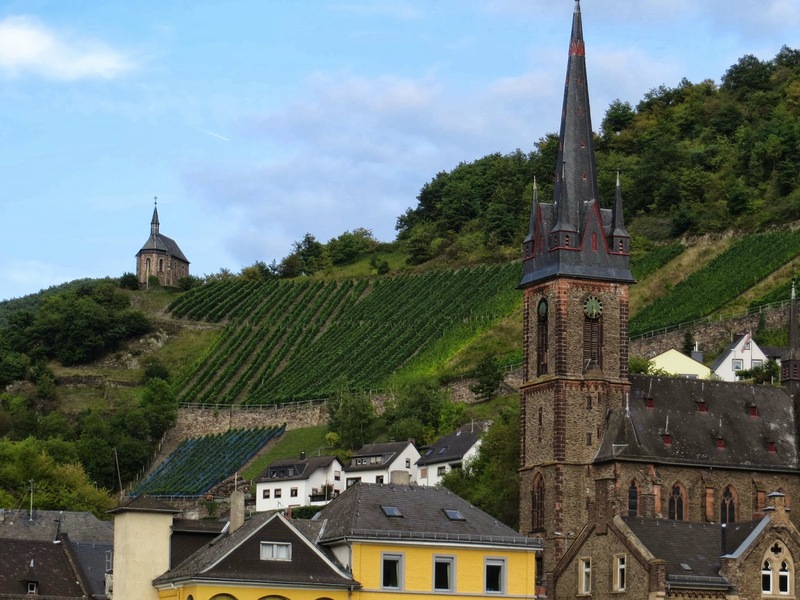 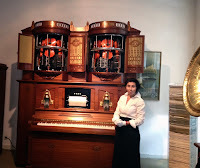 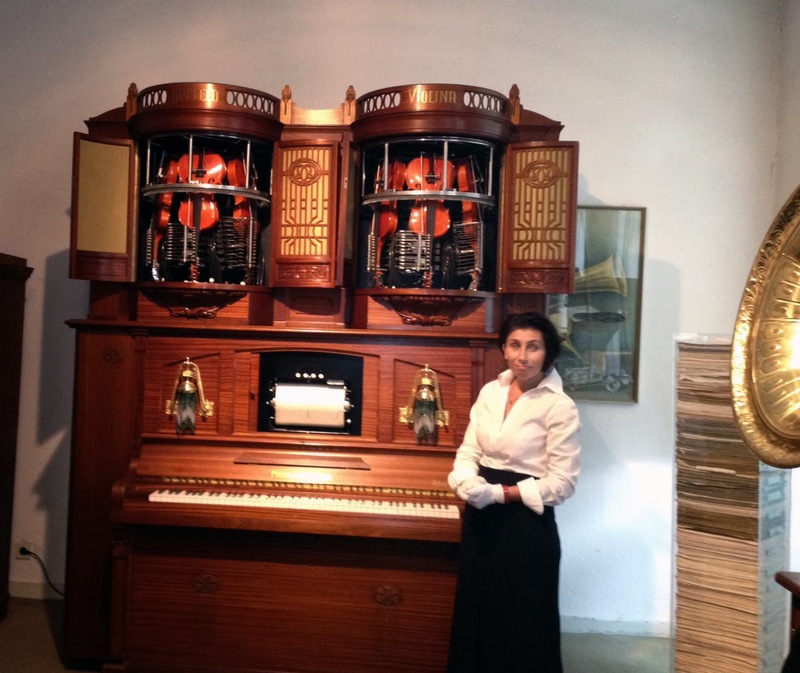 We arrived in Rüdesheim shortly after lunch and Ann visited Siegfried's Mechanical Musical Instrument Museum while I read more. 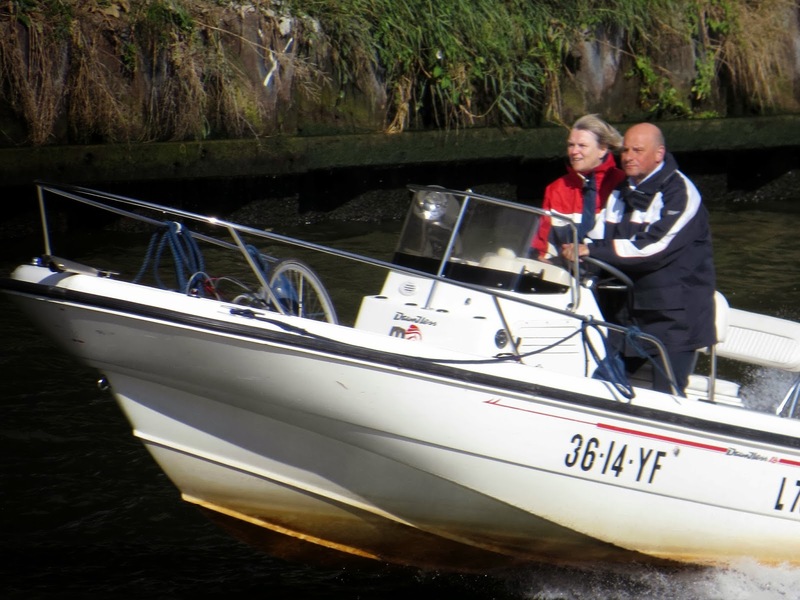 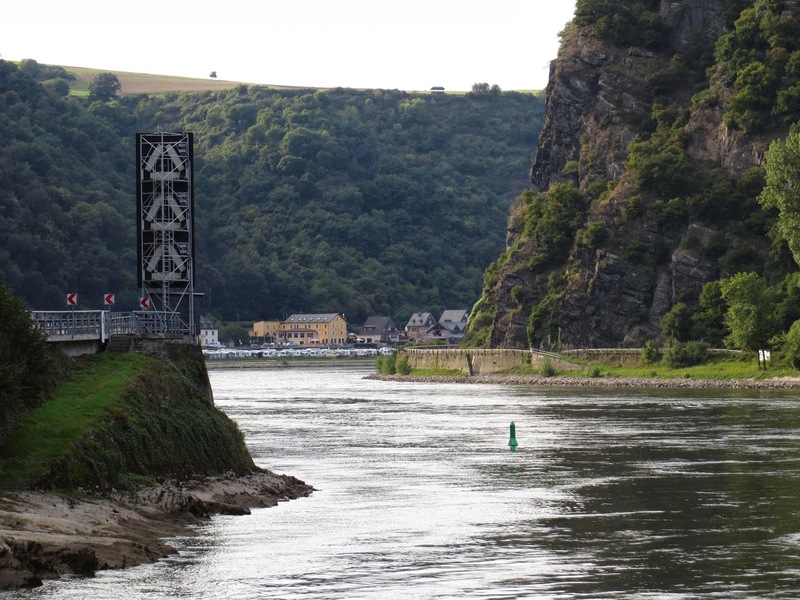 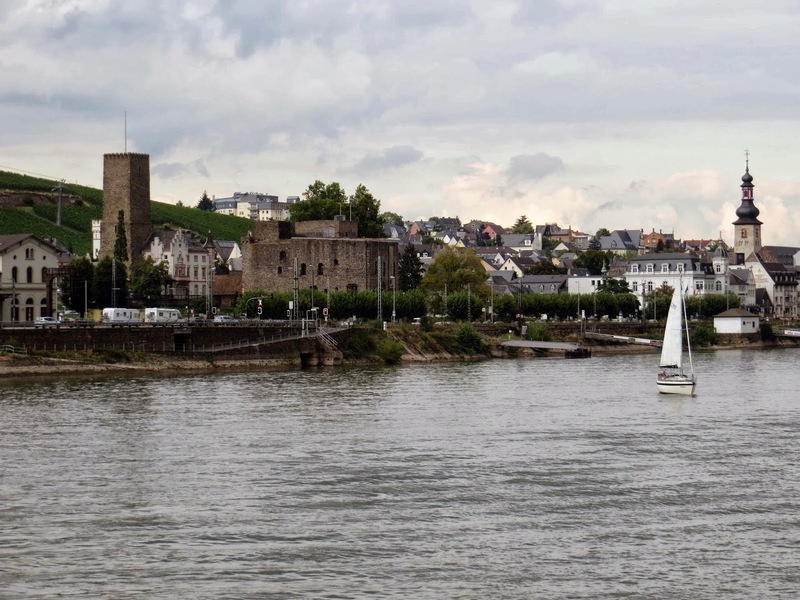 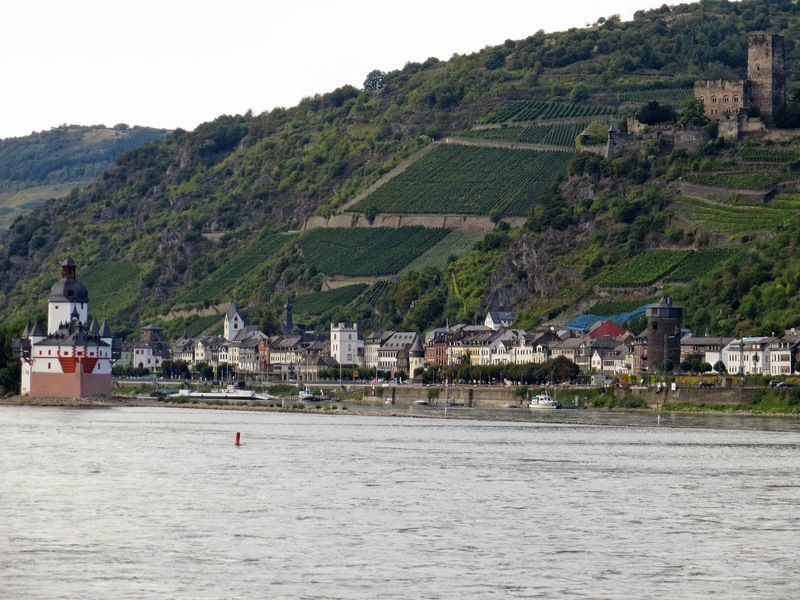 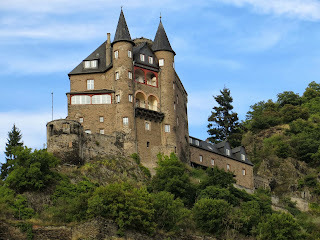 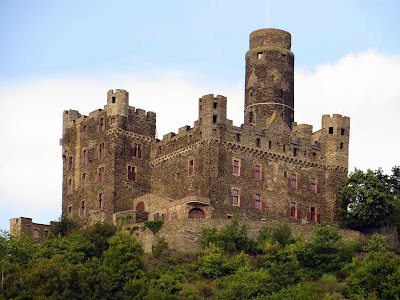 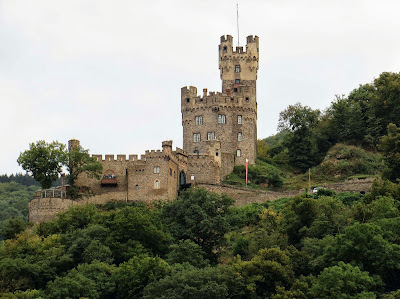 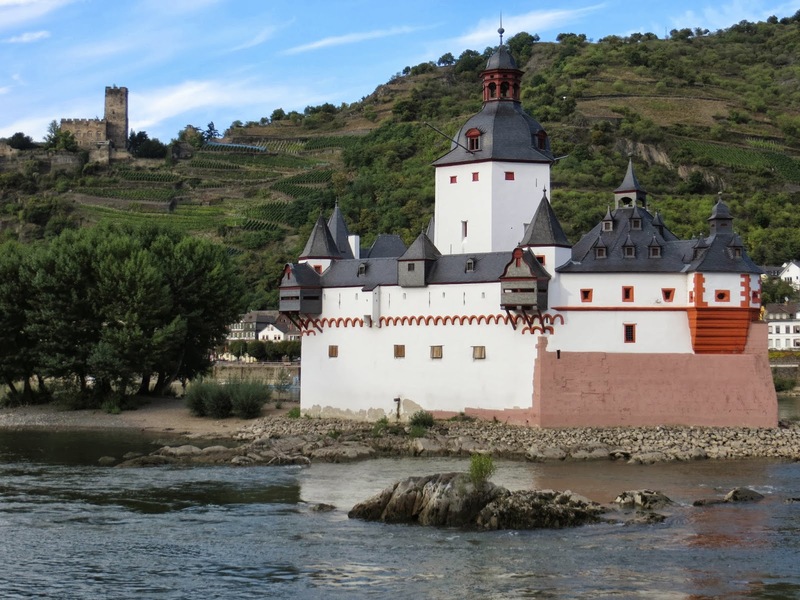 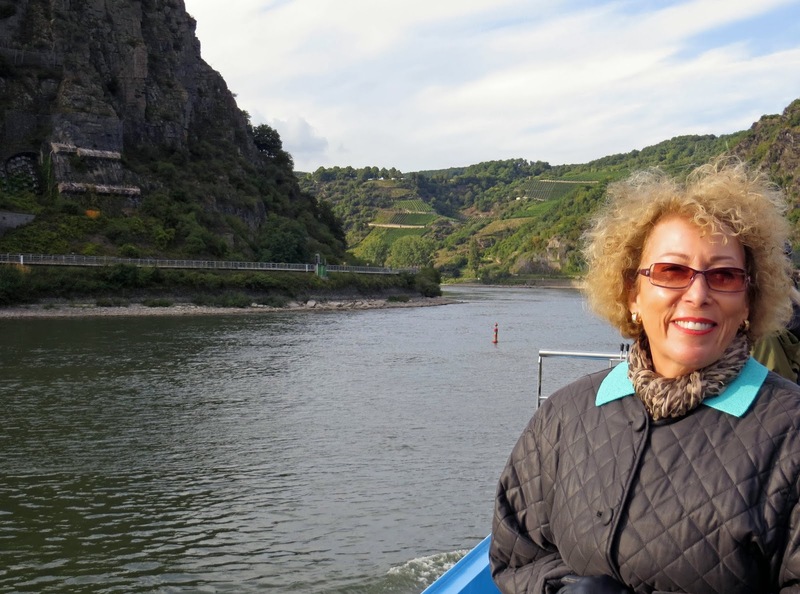 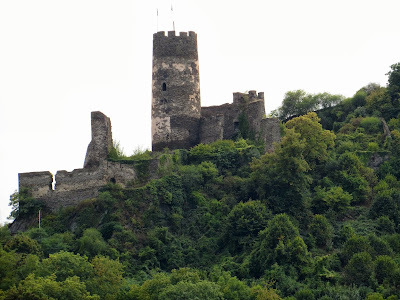 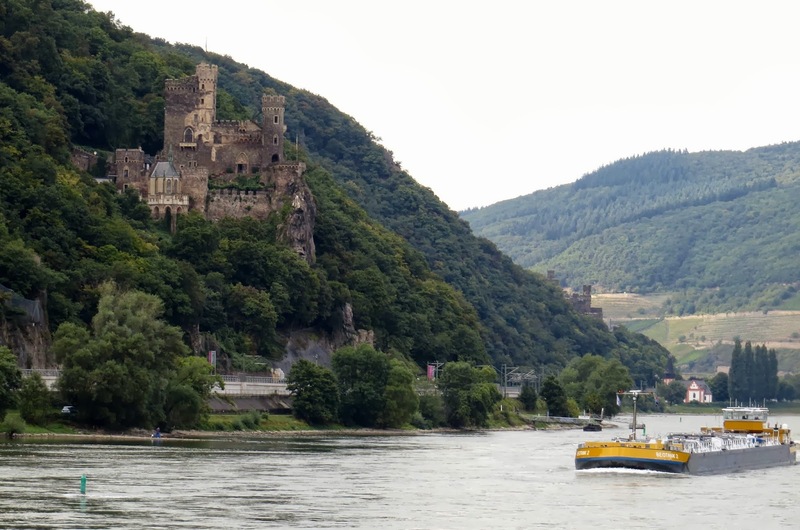 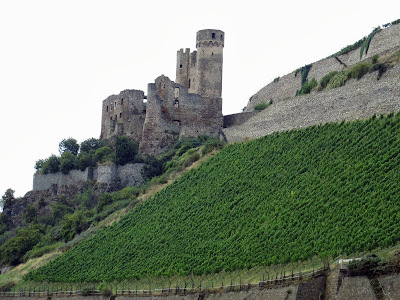 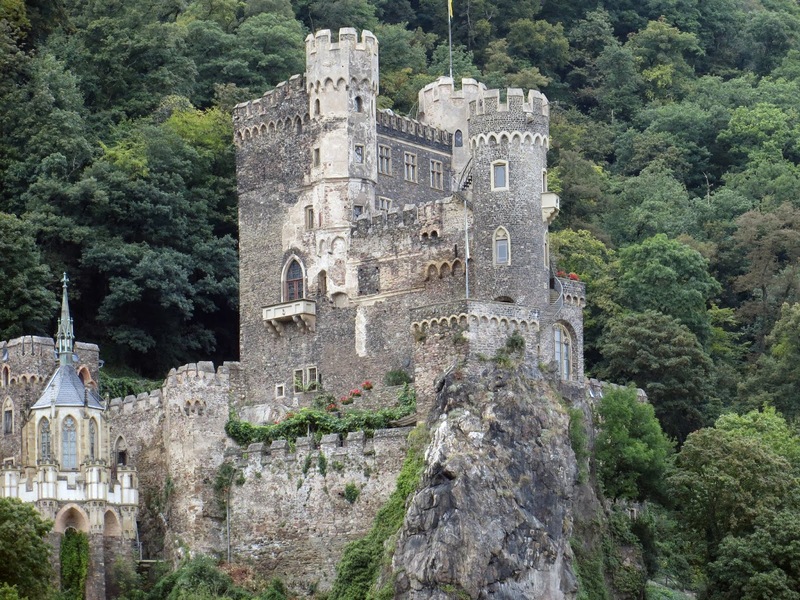 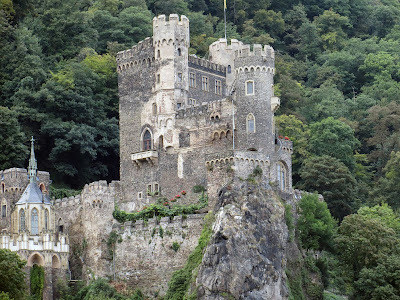 In the afternoon, the ship departed for Koblenz, cruising through the legendary Rhine Gorge, beginning the most scenic part of our entire trip, a 41 mile stretch of waterway comprising 30 castles & the famous Lorelei rock. 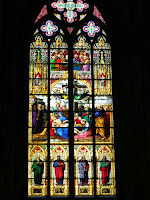 This made for ideal scenic photographs and I can't do justice to all but have selected a few. 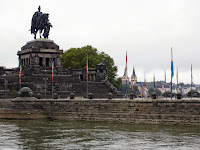 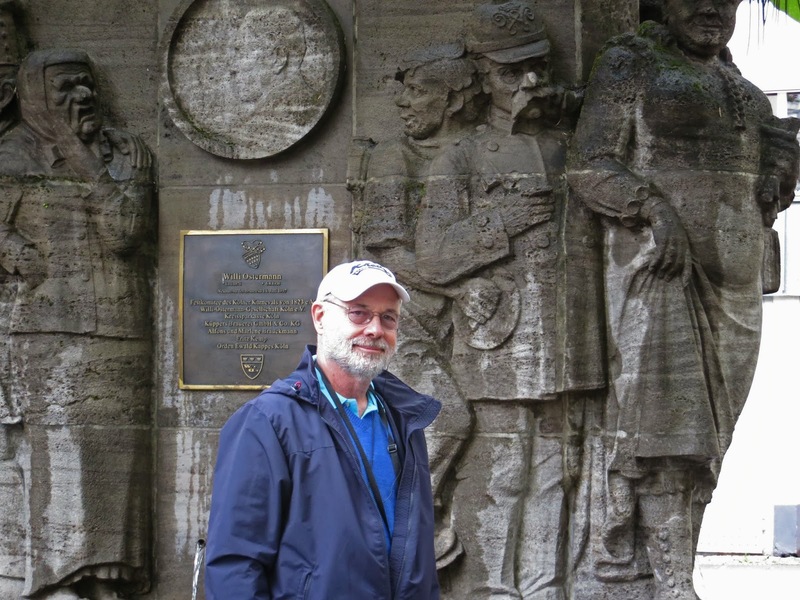 We arrived in Koblenz in the evening and took a brief walking tour on our own after dinner. 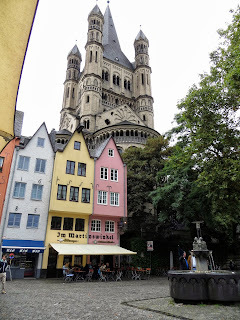 The ship cruised to Cologne in the afternoon, where we had a walking tour through the old part of the city and visited the fabled 13th-century gothic cathedral. 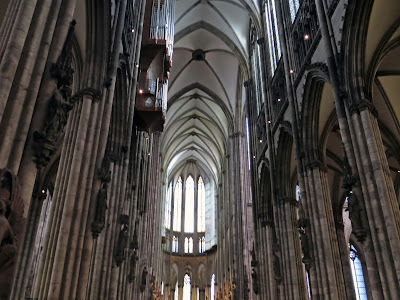 It was there that I had that epiphany of having seen the cathedral before in its war-torn state from my father's photographs (see the first part of this entry). 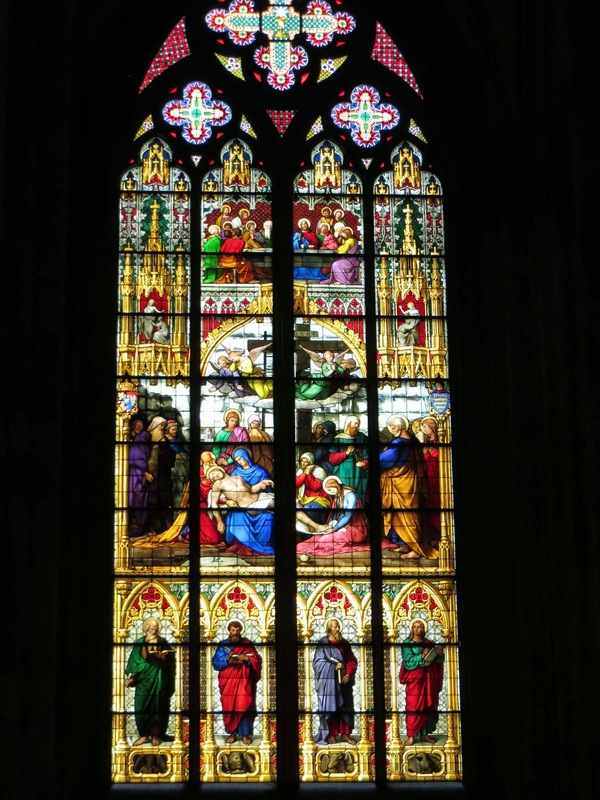 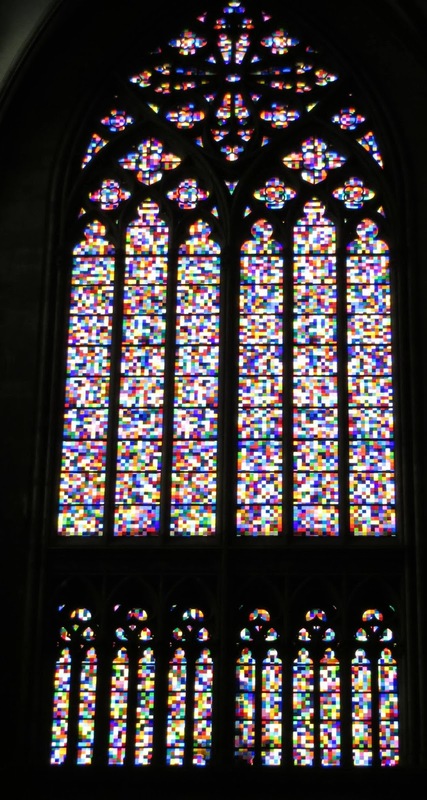 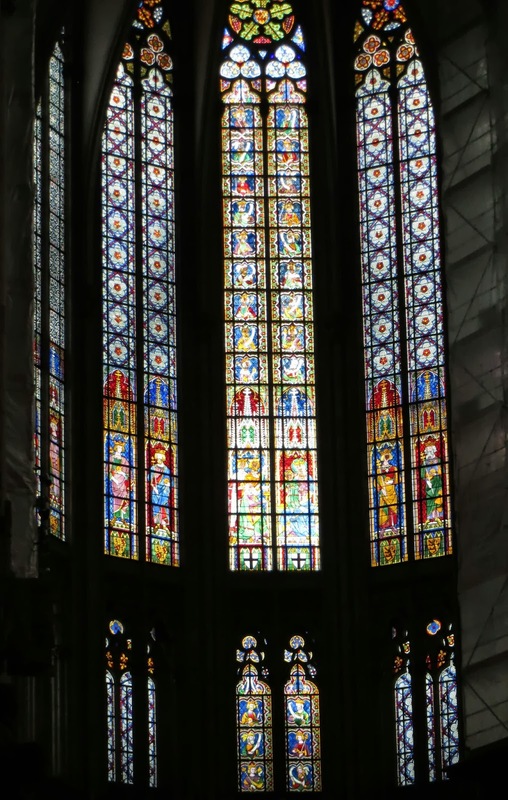 The stained glass window restoration was particularly impressive with even a modern new stained-glass window, designed by Gerhard Richter, one of Germany's leading artists. 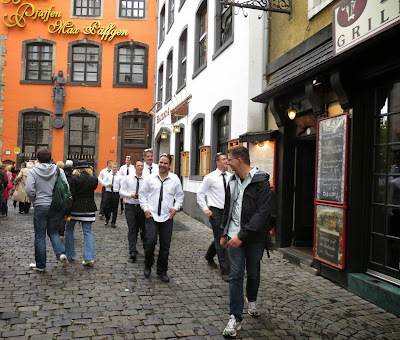 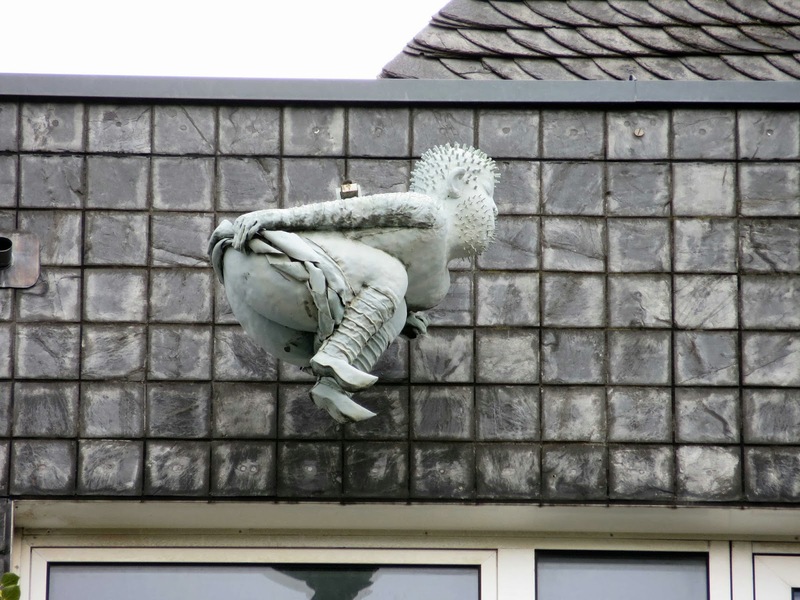 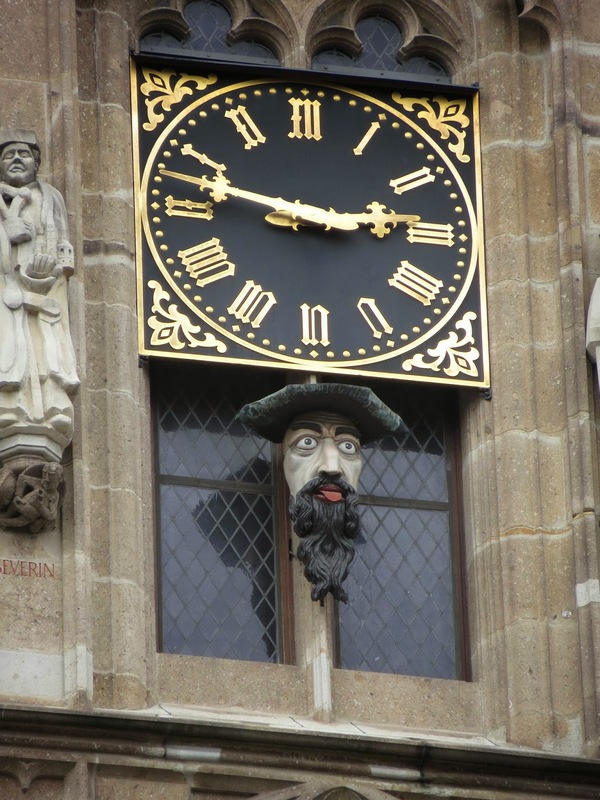 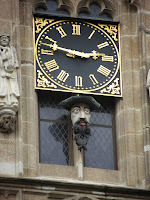 Cologne is also known for its beer, and we encountered some very well-served fellows leaving a bachelor party. 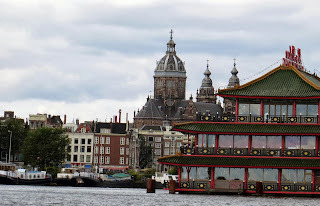 The ship departed that night for Amsterdam. After arriving in Amsterdam early in the afternoon, we enjoyed a scenic canal cruise through this city known as the “Venice of the North.” Amsterdam was the home of my parent company which meant we had been there several times before, so the canal cruise was not new; however we hadn't done it in so many years and it was Sunday, so all the "Sunday Drivers" were on the canal and it was interesting to see the boat traffic. 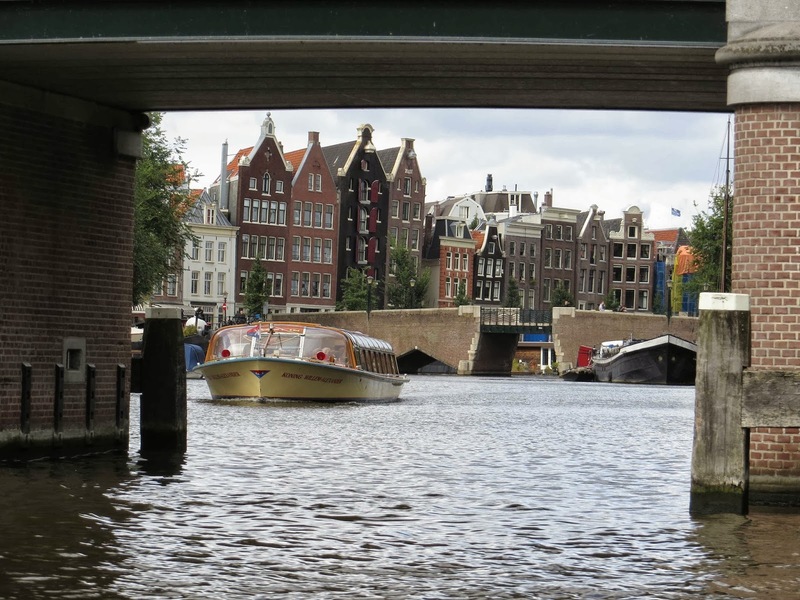 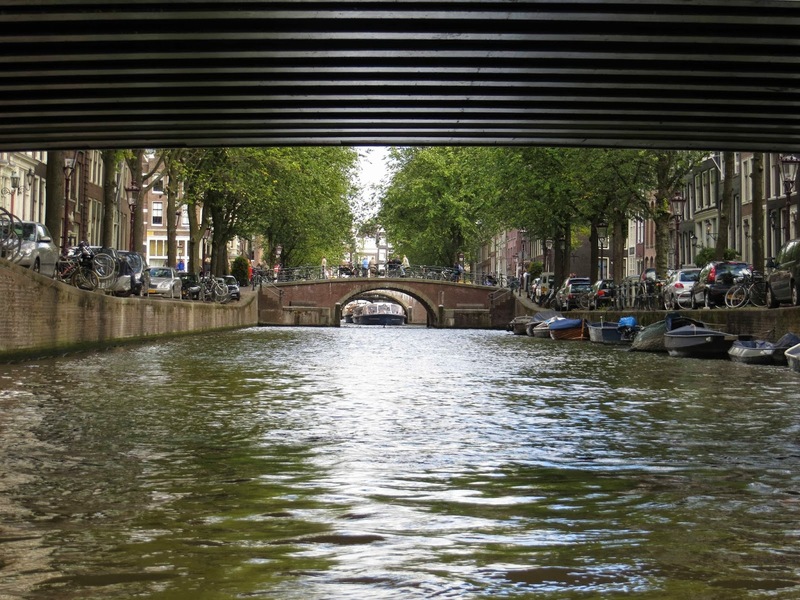 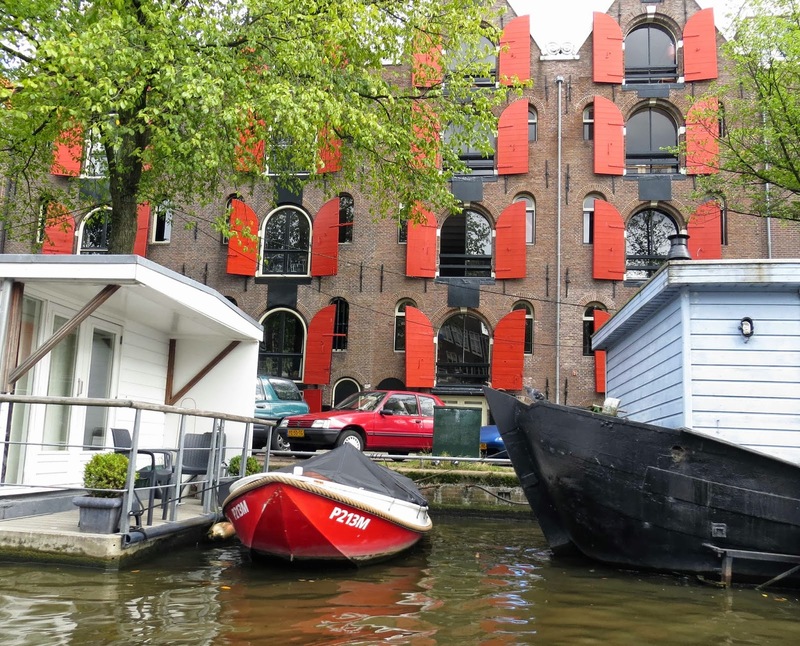 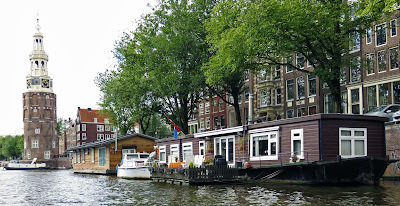 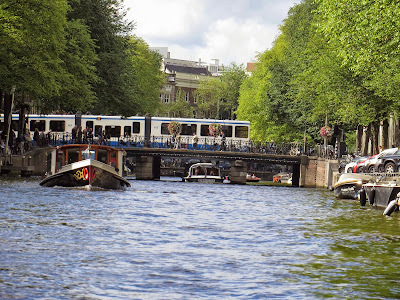 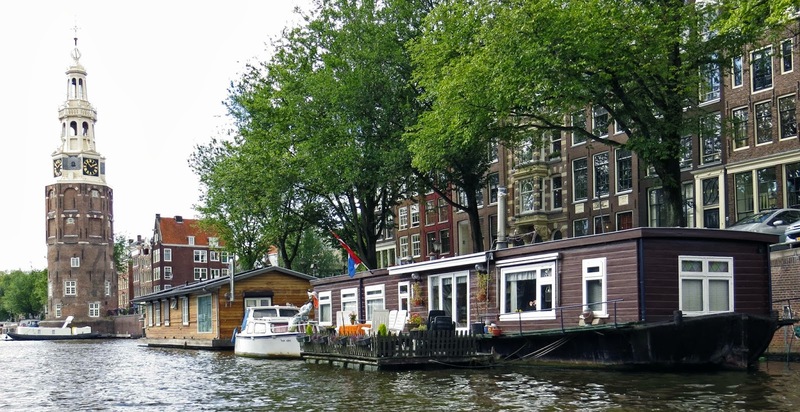 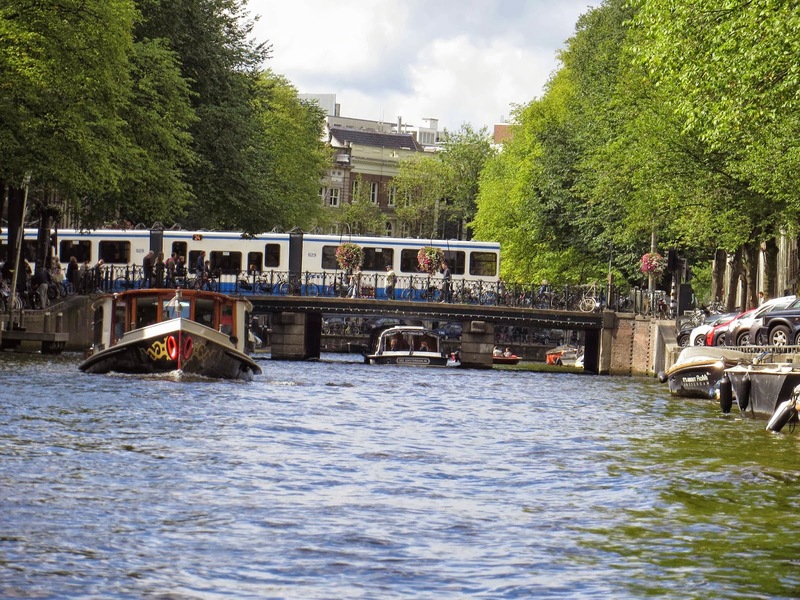 I always love seeing the barge homes along the canals and of course was again moved by the famous house where Anne Frank and her family once lived in hiding.On the way to Amsterdam on the river there was lots of small boat traffic flying by. 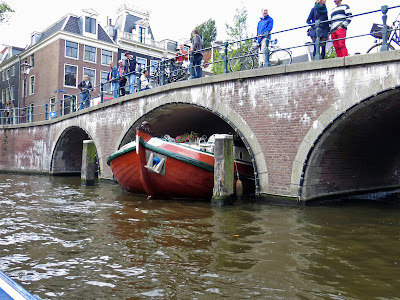 The day had an inauspicious beginning. 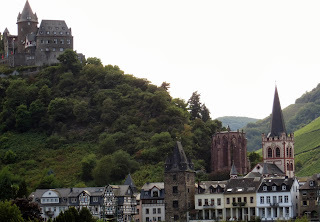 Since we had such an early flight, AMA had ordered a private car for us (all the buses were leaving later), but somehow it was cancelled by another passenger (they had a private cab scheduled for the same 5:45 am departure time), so we stood around, mostly outside in the early morning cold waiting for a replacement ride. Nonetheless we got to the airport still with plenty of time, but we were dropped off at the wrong terminal (this particular Lufthansa flight was operated by United, different terminal, but no one told us that) so we had to walk a mile with our luggage to get to the right one. 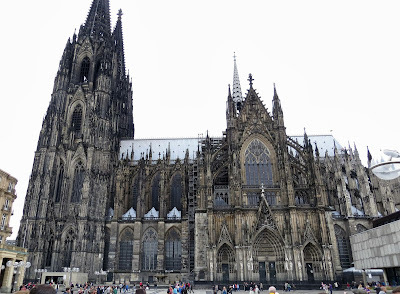 Then we had to deal with a Kiosk From Hell to get our boarding passes and to "upgrade" to "Economy Class Plus". 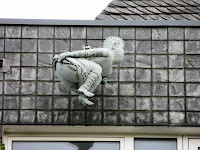 Flight went fine, but we got into Newark pretty tired and had to get to our car in Ft Lee, and then started our drive down to FL in the mid afternoon.. Made it to somewhere north of Baltimore, and as we were still on European time, got up at 3.30 AM the next day (Tues.) to make it through Washington before the Beltway becomes a parking lot. I had intended to drive the entire 1,000 or so miles right home at that point. 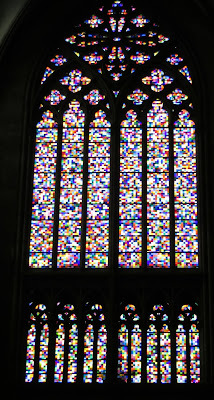 My GPS said we'd arrive around 8.00 pm, but we finally had to stop in St. Augustine, only 3.5 - 4 hours from our home, as there was intense rain in FL and between our exhaustion and that factor, decided to call it a night. Finally arrived last Weds. 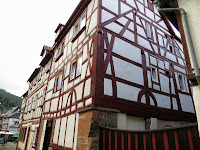 morning to find our other car's battery dead, although our house minder was supposed to have run it! 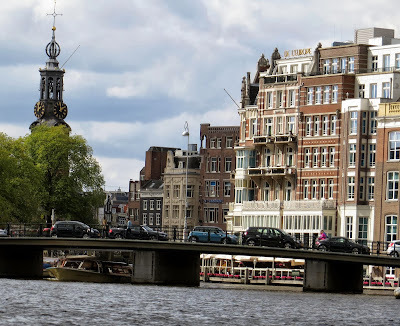 All in all, a wonderful trip, but in my opinion two weeks is a little too long. 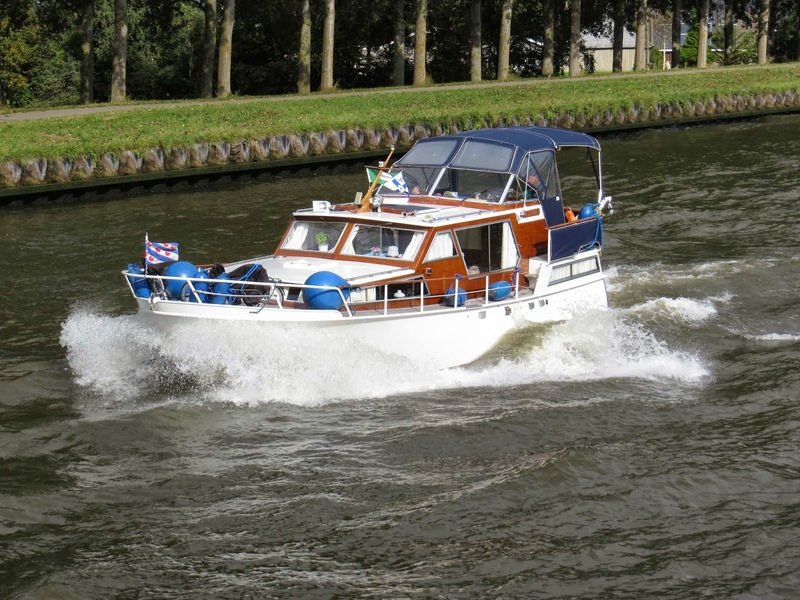 Unlike ocean cruising, we were on the go most of the time on a river cruise -- activities are heavily scheduled --and moments for reading were fleeting Nonetheless, I had brought a number of novels to read and managed to finish two. 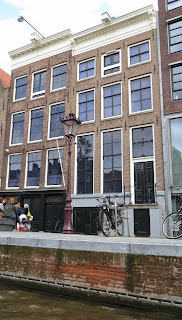 As this entry is already long enough, I'll write up my comments in another entry later. 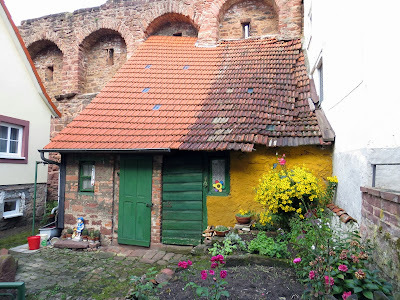 Perhaps I'll include some other photos of our trip as well (as if there are not enough already, but I have other favorite ones of doors, windows, passageways, locks we transited, miscellany which I enjoy photographing). 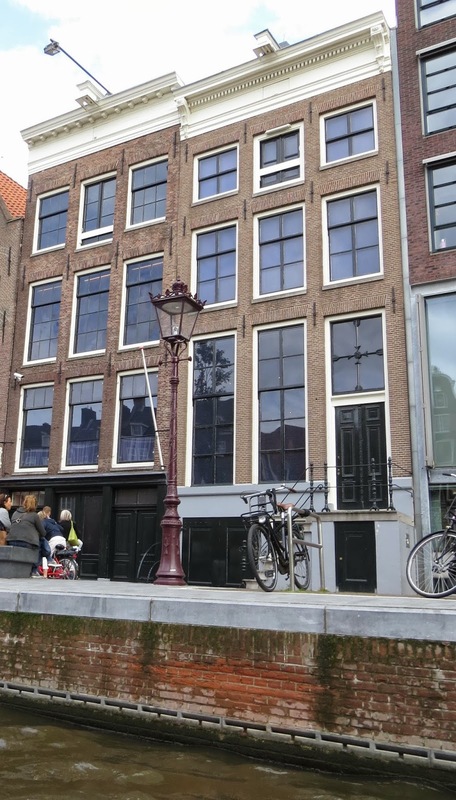 If you landed on this site via one of the photographs, just a reminder that there is a Part I, with other photographs of the trip, which can be viewed here.